Snail is a dish which many people like. 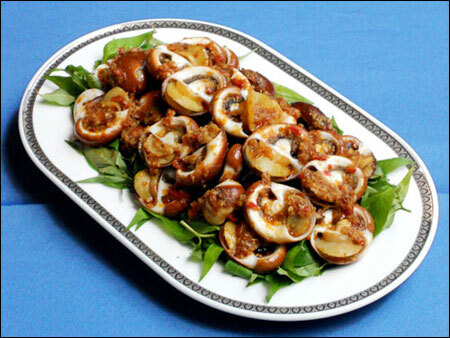 Please introduce for readers Vietnamese-food.Org the snail fried with sate chile sauce.This dish is attractive many people by two specific taste of this dish are fatty and spicy. • 1 kg fat snail. • 5 stalks lemon grass. • 1 slice of green pepper. • 1 tablespoon cooking oil. • 1 tablespoon minced lemongrass. • 1 teaspoon minced chili. • 2 tablespoons cold water. • flagrant knotweds are ate with fat snail. 1. Soak fat snail with rice water in 30 minutes, clean with water, to dry. 2 Lemon grass is cut stump , wash, to smash them to pieces. 3. Add to the pot 1 cup water + lemon + pepper horns ,to boil fat snails in 5 minutes, then to put out and to dry. 4.To boil oil, add to the minced lemongrass + minced chili +minced garlic , satay + salt + sugar + water.They are fried over medium heat about 10 minutes. 5.Fat snail fried with sate served with flagrant knotwed. Your article about Vietnamese food is really awesome and this meal looks delicious. Thanks for sharing this whole recipe. I will try this recipe in weekend. 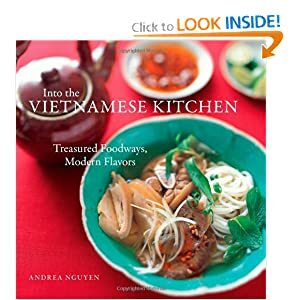 I love Vietnamese food very much and i have tried many vietnamese recipes which i got from YouTube , recipe books and many other website at home .